Gist provides you with a simple summary, or "gist", of all of your articles. Just select an article or connect your Pocket account and start summarizing! • Action Extension - You can now use the the Gist Action Extension to summarize articles from within any of your favorite apps. 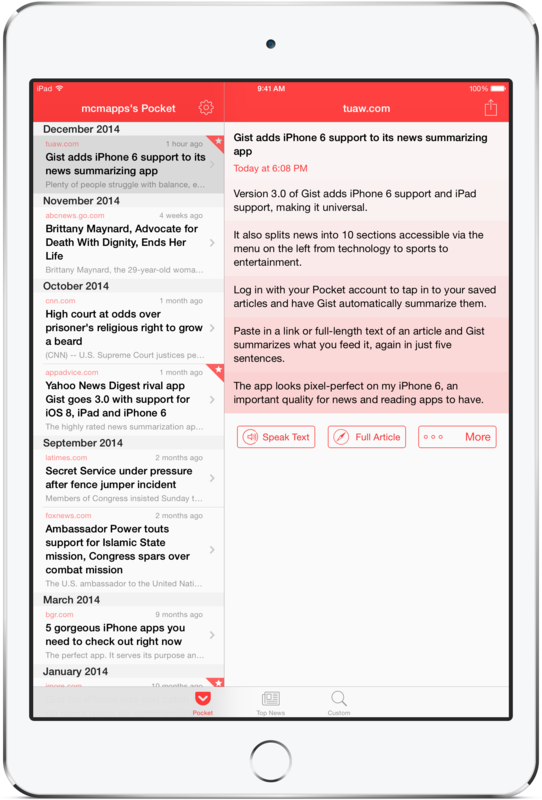 • Faster Summaries - Summaries now load up to 30x faster! • Accessibility - With full support for Dynamic Type, Gist now offers much improved accessibility. • iPad Support - Gist is now a universal app! It is now easier than ever to browse and read summaries of the latest news on your iPad. • iPhone 6 & iPhone 6 Plus Compatibility - Gist now takes advantage of the new screen sizes of the iPhone 6 and 6 Plus! • Landscape Support - As an added bonus, iPhone 6 Plus users can also take advantage of the special “split screen” view. 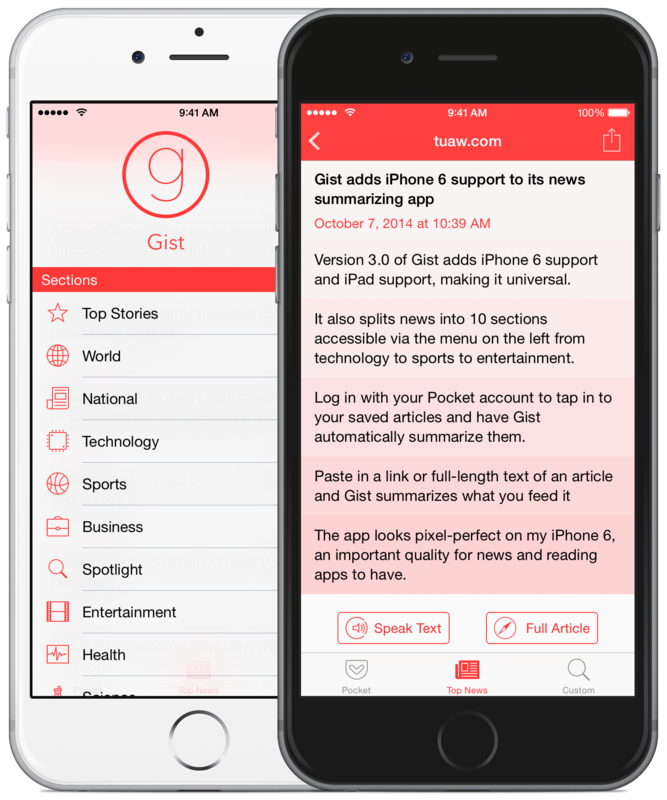 • iOS 8 Support - Gist is now fully compatible with iOS 8 and will require this version going forward. Gist is probably one of the best looking news apps I've seen in a while as well... it still earns a spot on my iPhone for when I want to catch up on news quickly. Gist is a great app for users looking for quick and dirty news information from a variety of sources. Simply just a great app! Perfect for reading the "gist" of all the news stories around the world, the US, and many other categories ... A definite buy! A great and unique app! The app is beautifully designed and is great for my daily news reading ... it's a must have for readers.